02/11/16 - 1:30pm - Syndicated food columnist Linda Gassenheimer, Special wine correspondent Fred Tasker and WLRN hosts Joseph Cooper and Bonnie Berman interview with Celebrity Chef, Rick Bayless, famous for his authentic Mexican cuisine, a winner of Bravo’s Top Chef Masters, his PBS series Mexico One Plate at a Time and his award-winning Frontera Grill in Chicago. He also has 4 other restaurants. He gives us tips for some hot and spicy Valentine’s dinners. Succulent Florida lobster is in season and is an elegant, simple dinner special enough for Valentine’s Day or for any day of the week. This lobster is also known as spiny lobster or spiny crawfish. Unlike Maine lobster it doesn’t have claws. The large tail provides the meat. Buy it fresh or frozen and grill or broil it. Black Beans and Rice is a Latin dish that has become mainstream throughout the States. For this quick dinner, I made it into a salad that can be eaten warm or at room temperature. Split the hard side of the tail with a sharp knife or poultry shears. Butterfly the lobster in its shell by slitting the meat in half lengthwise, cutting to the other side of the shell, but not through it. Spread out the shell. Sprinkle the meat with sherry. Mix the butter, oil and garlic together and spread over the meat. Place on the grill or on a baking tray under the broiler with the meat side up. Cover the lobster with foil. Cook until the meat is opaque, about 10 to 12 minutes. Makes 2 servings. Bring a medium saucepan 3/4 full of water to a boil. Add the rice and boil 10 minutes. Drain in a colander and run cold water through the rice. Mix the dressing, onion and garlic together in a salad bowl. Add the rice and black beans. Toss well. Add the cilantro and salt and pepper to taste. Toss again. Makes 2 servings. 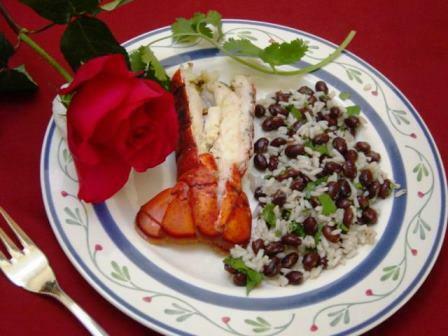 To buy: 2 Florida lobster tails (spiny lobster) 10 ounces each, 1 small bottle dry sherry, 1 small can black beans, 1 package frozen chopped onion and 1 package cilantro. Staples: Butter, canola oil, garlic, long-grain white rice, low-fat oil and vinegar dressing, salt and black peppercorns. Ask the seafood department to split the lobster tail for you. If you prefer, substitute any firm fish, shrimp or crab for the lobster. Parsley can be substituted for the cilantro. Red kidney beans can be substituted for black beans. A quick way to chop cilantro is to snip the leaves with a scissors. 12/10/15 - Join us for Thursday’s special Topical Currents with Linda Gassenheimer and Chef Dewey Losasso.